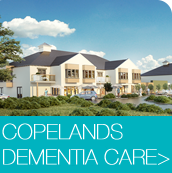 BCM held a successful Community Consultation event last week in Millisle to let local residents give feedback on the plans for Copelands, our exciting proposed Dementia & Nursing Care development. The room at Millisle Youth Forum was buzzing as the development team explained how the designs for the building will allow residents to live as independently as possible in a safe. enclosed environment. Residents were joined by local politicians including JIm Shannon MP and North Down MLA Peter Weir.